For most people, education is usually seen as a right, not a fight. But that's exactly what it was for Malala Yousafzai, a teenage girl attending school in northwest Pakistan. Yousafzai, now 15 years old, gained worldwide attention when she began blogging for the BBC under a pen name in 2009, following the Taliban's mandate that banned all girls from attending school. The teenager, who continued to attend school despite the ban and the Taliban's destruction of 150 schools in 2008, has become a symbol of resistance in Pakistan. Her father runs a local private school and also encouraged his daughter to pursue an education. When she was presented with the opportunity to blog for the BBC, he was in full support. "Of course, it was a risk," he told the BBC earlier this year, "But I think that not talking was a greater risk than that because then ultimately we would have given in to the slavery and the subjugation of ruthless terrorism and extremism." Such blatant defiance of the terrorist group was both dangerous and difficult. Yousafzai detailed the fear she felt each day risking her life by attending school as a female—fear of being followed to and from school, and fear of losing her school completely. "I had a terrible dream yesterday with military helicopters and the Taliban... I am afraid," she confessed in a January 2009 blog post. Yousafzai refused to let her fear control her, and instead used it as motivation to continue to advocate for an education for herself and other Pakistani girls. "Malala Yousafzai was one of the few brave voices who spoke out," writes Pakistan correspondent Rob Crilly for The Daily Telegraph. The Taliban described her actions as "obscene" and "openly propagating" Western culture. In October, a Taliban hitman followed Yousafzai onto her schoolbus, asked for her by name, and shot her in the head. Miraculously, she survived. Rather than scare others into submission, this act has empowered Yousafzai's cause. Pakistani girls hail Yousafzai as a hero and are furthering her fight while she recovers in a hospital in the U.K.
"Malala has sacrificed so much to tell the world about us," said a 13-year-old girl whose "dream is to become a teacher in the school that gave me the chance of an education," according to The Sun. "Girls in my country face many threats for attending school," said a 17-year-old girl, according to The Sun. "A terrible thing happened to Malala and we all pray she will get well soon. While she recovers many other girls are continuing her legacy by carrying on their education." Malala has become a symbol of the girls' education movement, and hundreds of thousands of people are calling for her to win a Nobel Prize for her brave actions. Over 200,000 people have already signed the petition on Change.org calling for a Nobel Prize for Malala, including Stephen Harper, the Prime Minister of Canada. "Malala doesn't just represent one young woman, she speaks out for all those who are denied an education purely on the basis of their gender," said Shahida Choudhary, the British woman who started the petition on Change.org. 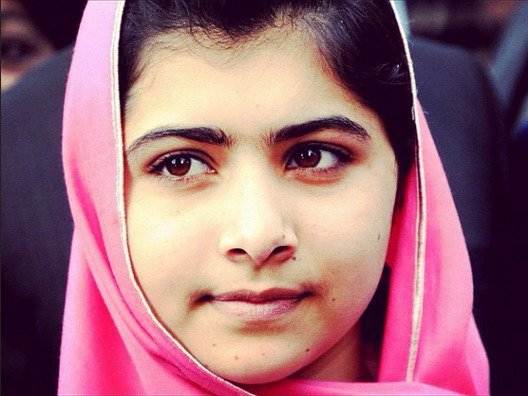 "I started this petition because a Nobel Peace Prize for Malala will send a clear message that the world is watching and will support those who stand up for the right of girls to get an education."